The Union of Students in Ireland (USI) held their Annual National Congress from the 1- 4 of April in The Breaffy House Hotel in Castlebar, Co. Mayo. 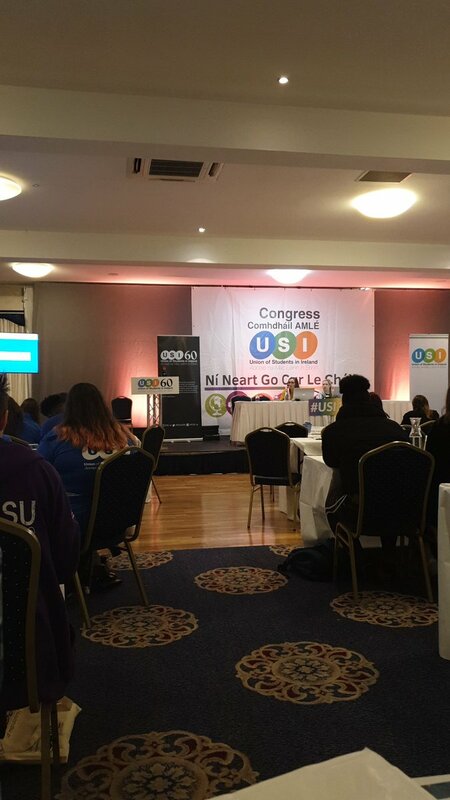 Students’ Unions from all over Ireland attended the congress to debate, discuss and vote on important motions and mandates that will be implemented by Member Organisations in the upcoming year with the support of USI. Topics discussed at the congress ranged from Climate Change, Direct Provision, Sexual Consent, Brexit and the Border Question, Mental Health, Hate Crime and The Irish Language. Motions were proposed by different Member Organisations or from the Officer Board of USI, and then delegates from different regions were given equal chance to talk in favour or against the motion. NUI Galway Students’ Union sent 19 delegates to represent the students of their University, who debated on nearly every motion proposed. The debates were broken down into different sections including Welfare, Gaeilge and Equality and Citizenship. Aoife Deasy, USI Leas-Uachtarán don Ghaeilge vehemently argued for the introduction of Gaeltacht grants for student teachers. As well as this, discussions surrounding Student Parents and Carers was brought forward with a motion to give them more support whilst in college being passed. He also mentioned food choices on campus and told an anecdote in where he asked for what he thought was chicken at the food counter – what he was handed was actually pork, which Muslims are prohibited to eat. The speaker urged the congress floor to pass the motion on the basis that students with different religions and backgrounds be given more support and respect on campuses when it comes to these religions and rituals. Finally, USI Congress was not without its controversy. A motion which was brought forward by outgoing USI President Síona Cahill surrounding an Affiliation Fees review split opinion on the Congress floor. USI receives 70% of their income from Member Organisations affiliation fees, which is €5 per full-time student. This rule has been in place since Congress 2003. Technological Universities Dublin, who have recently merged together to become the biggest Students’ Union in Ireland, passionately opposed the motion to review affiliation fees as they believed that it would result in an increase to these fees. TUD left the Congress floor before voting commenced, protesting the review. The motion was passed after a hard guillotine fell at 10pm and voting had to take place. USI Congress finished on Thursday 4 of April with Officer Reports for the year. With a whole new officer board being elected for the next year, all motions passed at Congress should be introduced as campaigns in the academic year 2019/2020.